ReStreet is a web-based and mobile tool that allows for provide dynamic, participatory planning of streets. 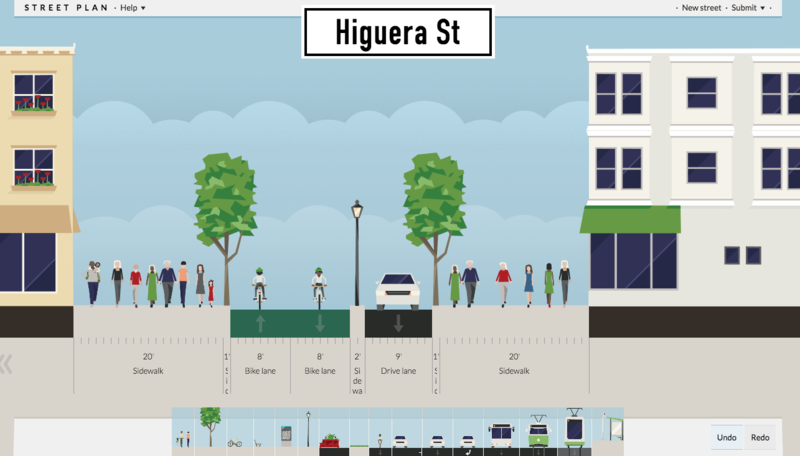 The tool allows for urban planners and decision-makers to capture and then aggregate public feedback on the future vision on how streets can be made more healthy and livable. Our target users are individuals from communities engaging in dialogues about how to reshape streets for healthier lifestyles. This includes cities, planning and urban design firms, non-profits and advocacy groups. Our goal is for it to be a part of the participatory street design process, particularly in areas which have been traditionally underserved and not had a voice in the quality of the street and suitability of their neighborhoods for walking, biking and transit. The tool allows for us to customize a case study street and then capturing data from citizens about what the future vision for that street, space or urban area—articulating how the public at large prefers and how they want to allocate active transportation resources in that location. This allows for us to show community priorities and trade offs that can inform street section design and traffic modeling / simulation by cities. The tool is synergistic with visioning docs, having had a preliminary beta test as a part of a downtown vision plan, active transportation planning projects, and zoning code updates – with the potential to be particularly useful in identifying community preferences for street form as a part of form based code updates. Ultimately it provides a community based process for cities to get a data pulse on their community and articulate those results online and in plans.